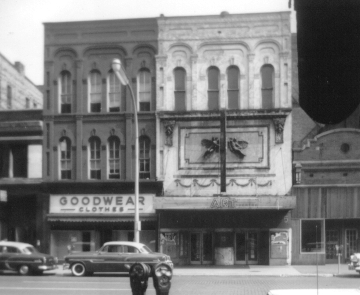 This was a narrow, 3-story brick theater on a 25' x 100' lot, the north ½ of Lot 146, Kent theatre lat. 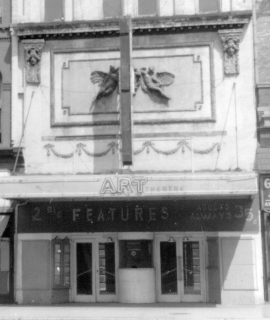 Originally the Superba, the theater became the Rialto, and for several years (e.g., cf. G.R. Press, April 26, 1949), it was known as the Fox. The 1954 assessed valuation was $13,000. Local attorney Samuel H. Himelstein, 404 McKay Tower 49503, owned the building from just prior to World War II, and he leased it to theater operators until 1957. The building had gas and steam heat, a tar roof, a full basement, and an alley at the rear. On Thursday, June 13, 1963, at 2:39 p.m., a discarded cigarette or match started a fire in the ticket booth, causing $10,000 damage. The stubborn blaze burned up to the top floor in the front of the building, and fire fighters had to rip away much of the ornate plaster façade to get at the flames in the front walls. The forlorn structure was finally demolished for urban renewal in late November, 1965. The city-county complex occupies the site.